This article is meant to serve up some “basic techniques” to start with. We will continue to follow up with more instructional videos and information in time to help you advance your riding level. We hope that for the novice and even some intermediates that this essential list will help make your first days of snowmobiling in powder more enjoyable. We’re talking bomber proof gloves, jackets and other articles of clothing. Act as if you are heading into the artic so dress accordingly. Klim makes incredible gear to keep you dry and riding all day. Make sure to dress in layers, avoiding cotton, especially on your feet. Water wicking synthetics are your best choice for base layers. Always, we mean ALWAYS carry avalanche equipment (Beacons, probes, shovels) and know how to use them – it may surprise you how many folks own a beacon but do not actually know how to use it. Have you ever sunk your sled in the snow or witnessed others trying to yank their sled out of hole? It’s an awful experience and can be easily avoided by simply remembering to always stop on a pre-existing track or area of hard pack. If you happen to be the lucky one who gets to shoot off into an untouched powder field first, just remember to circle back onto your own track if you need to stop. Also avoid inclines but if you must stop on an incline, point your motor downhill as it will make it easier for you to get going again. With ever changing snow conditions you must practice good throttle control techniques. While out riding, play around with the throttle on your machine and take note of the subtle movements that the sled makes when you throttle back vs throttling hard and trenching. Sometimes, if you’re throttling hard and the sled begins to sink you can back off the throttle and the snowmobile will begin to resurface. When this happens, you can then hit the throttle again and move along. 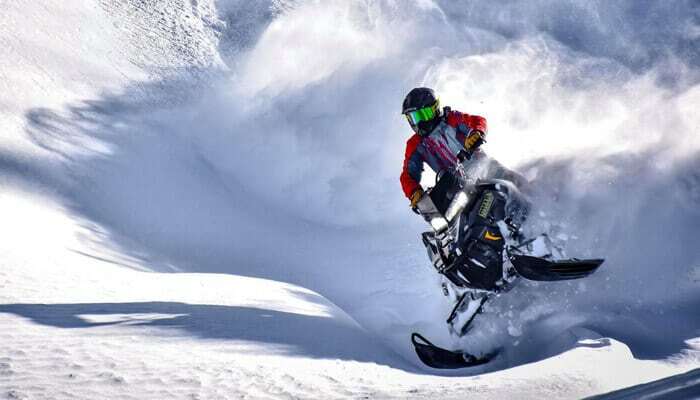 The Laws of Physics play a major role in snowmobile powder riding. The key is to keep your snowmobile moving through the snow. In order to do this, you must always pick your lines (mind your surroundings, Batman). Pick your lines through obstacles before you reach them; keep your head up and always look ahead of your snowmobile. Sitting is the one position that you should NEVER EVER do while riding through deep powder. Always stand or kneel on your sled and adjusting your handle bars, brake and throttle positions will allow you to do just that. 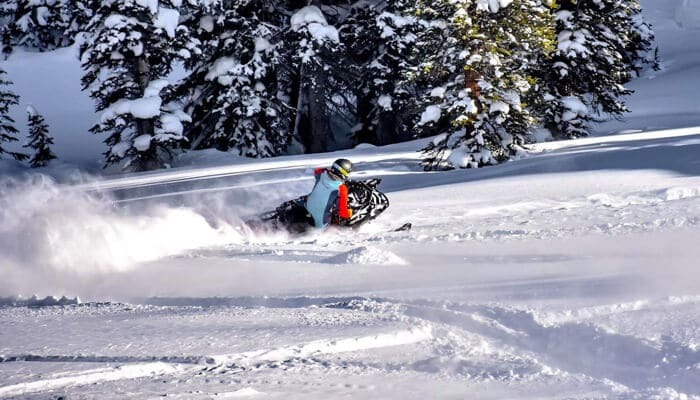 Unlike cruising through the hard pack trails of the Midwest, Snowmobiling in deep Colorado powder requires an active riding stance where the rider must transfer weight from side-to-side. This allows the rider to control the sled while turning through deep pockets of snow – a feat which is deemed impossible while sitting. When you first get out into the back country, you will see more experienced riders taking the steep and deep routes. Sure it looks amazing but be mindful of your current skills. If you get over amped to go big, you may find yourself in an endless game of “drag the sled out of tree well.” A 3-hour tour into the back country can turn into the winter’s version of Gilligan’s island if you try to push yourself past your level of skill too quickly. At some point in time, you will get stuck. In fact, even the best riders will find themselves stuck from time-to-time. It’s just a part of the sport and so it makes sense to have some knowledge as to how best to deal with the situation. Unless you’re an ex-linebacker from a D1 School, you probably cannot lift your 500lb machine so stop trying to lift the machine out of the hole. Remember what we said about stopping on packed snow? The same rule applies to getting unstuck. Take a few minutes and stomp down some snow with your feet. Using your legs and feet, move the snow from under the front of your sled. Once the snow is cleared, create an exit track by creating a small pathway in the snow – just walk through the snow. You just need a track that will allow the sled to climb out of the hole that it is in. Once the track is set, give the machine some gas and you’re back out on top. 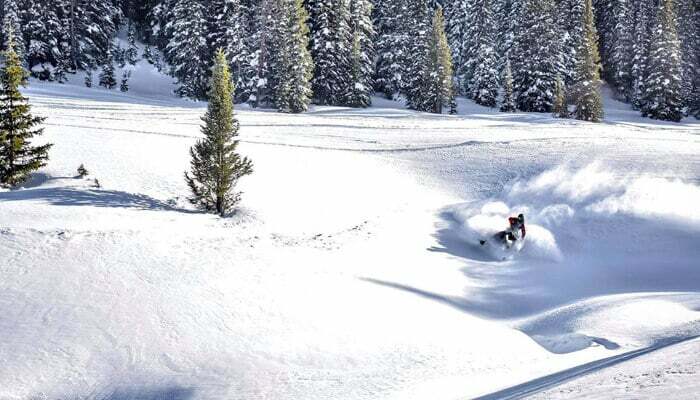 Again, this is a short list in what we hope to be an on-going series on best practices and techniques for Snowmobile riding in deep powder. Please check back often for more insights, educational videos and responses to questions. If you would like to learn more about where you can snowmobile in Colorado, please visit our Colorado Map.